Relatively remote area of dispersed farms and woodland bordering Eglwyseg Mountain with traces of quarrying and mining in the later 19th and early 20th centuries. Early land use and possibly woodland clearance is suggested by the discovery of a Late Bronze Age socketed axe on Fron Fawr. 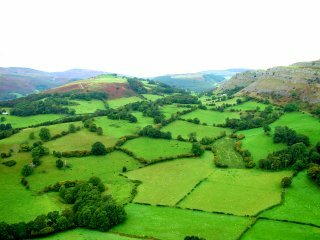 The area formed part of the early medieval kingdom of Powys and from later 12th century it constituted part of the separate northern portion of the kingdom known as Powys Fadog. Following the Edwardian conquest in the late 13th century it formed part of the marcher lordship of Chirkland. Little is known of the history of land use and settlement in the later prehistoric and early historic periods, though it is evident from the Extent of Chirkland that by the later 14th century the area was being farmed by a number of family groups. Agricultural produce at this period including the rearing of pigs, sheep and goats, and the growing of oats, farmers also no doubt exploiting the upland summer pastures of Eglwyseg Mountain as well as the lower-lying and more sheltered winter grazing within the valleys. The area continued to be relatively remote and largely farmed by freehold farmers despite the growth of estate farming in neighbouring areas in the 17th and 18th centuries, the Eglwyseg valley being described by Thomas Pennant in A Tour in Wales, published in 1783, as being ‘adapted only for the travel of the horsemen’ and ‘chiefly inhabited (happily) by an independent race of warm and wealthy yeomanry, undevoured as yet by the great men of the country’. A medieval church in Eglwyseg is marked on the 16th- to 17th-century maps of Saxton and Speed but this evidently disappeared by 1808. The school church of St Mary’s, Eglwyseg, was opened in 1871 and has now converted to a dwelling. A Calvinistic Methodist chapel also existed to the north of Plas yn Eglwyseg in the 1870s, now lies in ruins. Higher ground, between about 100–470m above sea level, above the valley floor and bordering the upper reaches of the Eglwyseg river including the distinctive smaller rounded hills of Fron-fawr and Foel Eglwyseg, visually dominated by the limestone escarpment of Creigiau Eglwyseg. The underlying solid geology is largely composed of Silurian shales. Predominantly small irregular fieldscapes with some large irregular fields representing piecemeal woodland clearance and enclosure probably from at least early medieval times onwards. Sinuous broadleaved woodland, including some ancient broaldleaved woodland, on some of the steeper valley slopes with modern conifer woodland around the lower slopes of Foel Eglwyseg, planted in the second half of the 20th century. Most of the enclosed farmland is used for pasture today though it is evident from the presence of field lynchets and traces of ridge and furrow that arable cultivation was more widespread in the past. There are also relatively extensive areas of unenclosed rough pasture on the summit of Foel Eglwyseg and on the western flanks of Fron-fawr. Field boundaries are predominantly represented by multi-species hedges, often with a high proportion of mature trees, but there are also a number of areas with drystone walls. Narrow twisting lanes give access to the dispersed farms and houses within the area. Several small 18th-century stone bridges survive across the Eglwyseg streams such as that near Plas yn Eglwyseg. There were many fords across the streams until the early 20th century when a number were culverted below the road. A number of the farmhouses are evidently of 15th to earlier 17th century in origin, Ty-brith being in origin an open hall house with raised crucks on stone rubble walls and Dinbren Isaf being a timber-framed farmhouse (associated with a former cruck-built farmbuilding) later encased in stone, superseded by an early 19th-century farmhouse. Later stone or stone and timber farmhouses such as Ty-canol and Plas Uchaf are of later 17th- and 18th-century form though probably occupy earlier sites. Likewise, Plas yn Eglwys farmhouse was newly built in the 19th century but is associated with earlier farm buildings. Dinbren Hall is the sole representative of a gentry house within the character area, once the centre of a small estate. Picturesquely sited in view of Creigiau Eglwyseg and Castell Dinas Brân it was again built on the site of an earlier house, extended in the 1790s and formerly had pleasure grounds and tree-lined avenues. A number of discrete areas of former industry and processing survive within the area, mostly dating from the later 18th and 19th centuries. Water power was harnessed to operate a flour mill on the Eglwyseg river at the Mill in the 1870s. The remains of former small surface and subsurface hillside slate workings are to be seen at Pant Glas and Aber-gwern the latter now partly in conifer woodland. Traces of processing buildings survive at both quarries, the former slate mill at Pant Glas now having an alternative use. Both quarries were in operation in the 1870, Aber-gwern having closed by the end of the 19th century and Pant Glas by about 1920. Smaller stone quarries for building materials, dating from perhaps the 18th and earlier 19th centuries, are to be found elsewhere in the area. Several small limekilns again probably of later 18th- or early 19th-century date lie just below the limestone escarpment of Creigiau Eglwyseg and at World’s End, where there are also traces of a short-lived lead and silver mine in operation between the 1860s and 1880s. For further information please contact the Clwyd-Powys Archaeological Trust at this address, or link to the Countryside Council for Wales web site at www.ccw.gov.uk.